July 12, 2011—Over the course of a generation, Brazil has emerged as both a driver of growth in South America and as an active force in world politics. A new Council on Foreign Relations (CFR)-sponsored Independent Task Force report asserts "that it is in the interest of the United States to understand Brazil as a complex international actor whose influence on the defining global issues of the day is only likely to increase." Brazil currently ranks as the world's fifth-largest landmass and fifth-largest population, and it expects to soon be ranked the fifth-largest economy. The report, Global Brazil and U.S.-Brazil Relations, recommends that "U.S. policymakers recognize Brazil's standing as a global actor, treat its emergence as an opportunity for the United States, and work with Brazil to develop complementary policies." The Task Force is chaired by former secretary of energy Samuel W. Bodman and former president of the World Bank James D. Wolfensohn and is directed by CFR Senior Fellow and Director for Latin America Studies and Director of the Global Brazil Initiative Julia E. Sweig. Recognizing Brazil's global role, the report recommends that the Obama administration now fully endorse the country's bid for a seat as a permanent member of the United Nations Security Council (UNSC). It argues that "a formal endorsement from the United States for Brazil would go far to overcome lingering suspicion within the Brazilian government that the U.S. commitment to a mature relationship between equals is largely rhetorical." Domestically, Brazil's "inclusive growth has translated into a significant reduction of inequality, an expansion of the middle class, and a vibrant economy, all framed within a democratic context." Consequently, Brazil has been able to use its economic bona fides to leverage a stronger position in the international, commercial, and diplomatic arenas. The report stresses the importance of regular communication between the presidents of both countries. "Cooperation between the United States and Brazil holds too much promise for miscommunication or inevitable disagreements to stand in the way of potential gains." A mature, working relationship means that "the United States and Brazil can help each other advance mutual interests even without wholesale policy agreements between the two," notes the report. - the U.S. Congress "include an elimination of the ethanol tariff in any bill regarding reform to the ethanol and biofuel tax credit regime." - the United States "take the first step to waive visa requirements for Brazilians by immediately reviewing Brazil's criteria for participation in the Visa Waiver Program." - the U.S. State Department create an Office for Brazilian Affairs and the National Security Council (NSC) centralize its efforts under a NSC director for Brazil in order to better coordinate the current decentralized U.S. policy. The bipartisan Task Force includes thirty distinguished experts on Brazil who represent a range of perspectives and backgrounds. 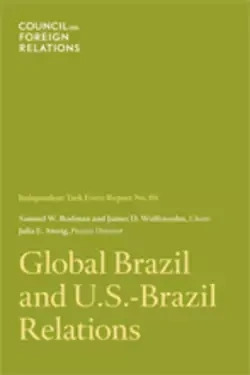 The report includes a number of additional views by Task Force members, including one that notes, "We believe that a more gradual approach [regarding Brazil's inclusion as a full UNSC member] would likely have more success in navigating the diplomatic complexities presented by U.S. support for Brazil." Another view asserts, "If the United States supports, as the Obama administration has said it does, leadership structures in international institutions that are more reflective of international realities, it must support without qualifications Brazil's candidacy [for the UNSC]." Jed N. Bailey is an expert in energy markets in developing countries and the founder of the Popo Agie Group, an incubator focused on products and services that promote learning at all ages. He was previously vice president for applied research consulting at IHS CERA, where he was responsible for IHS CERA's global bespoke research and consulting practice. Bailey is the author of over seventy IHS CERA reports and directed IHS CERA multiclient studies that examined the energy futures of Brazil, China, Mexico, South America, and Southeast Asia. He has been widely quoted in publications ranging from the Economist and the Financial Times to the Iran Daily and has appeared on Bloomberg Television and CNN International. His current projects at the Popo Agie Group include developing Kaleidoshapes, a large-scale construction and dramatic play toy for young children; experimenting with the graphical presentation of complex data; and exploring the use of narrative in corporate strategy and communications. Bailey holds a BS from the University of Wyoming and an MS from the Massachusetts Institute of Technology. Samuel W. Bodman served as U.S. secretary of energy from 2005 to 2009 and previously served as deputy secretary of the treasury and as deputy secretary of commerce. Bodman currently serves on the board of directors of the Hess Corporation, the AES Corporation, and Weatherford International. He is a trustee of the Massachusetts Institute of Technology (MIT), Cornell University, and the Carnegie Institution, as well as a lifetime trustee of the Isabella Stewart Gardner Museum. He is a member of the National Academy of Engineering and the American Academy of Arts and Sciences. He is also a chairman of the advisory board of the University of Texas Energy Institute and a member of the energy task force of the Hoover Institution at Stanford University. He serves on the international advisory council of the King Abdullah University of Science and Technology. Bodman earned a BS from Cornell University and a PhD from MIT, where he was also associate professor of chemical engineering. He began his work in the financial sector as technical director of the American Research and Development Corporation. In 1983 he became president and CEO of Fidelity Investments and a director of the Fidelity Group of Mutual Funds. In 1987, he joined Cabot Corporation, where he served as chairman, CEO, and director. R. Nicholas Burns is professor of the practice of diplomacy and international politics at the Harvard Kennedy School and director of the future of diplomacy project and faculty chair for the programs on the Middle East and on India and South Asia. He serves on the board of directors of the school's Belfer Center for Science and International Affairs and on the boards of several nonprofit organizations. Ambassador Burns served in the U.S. Foreign Service for twenty-seven years until his retirement in April 2008, serving variously as undersecretary of state for political affairs, U.S. ambassador to NATO and Greece, and State Department spokesman. He was senior director for Russia, Ukraine, and Eurasia affairs on the National Security Council and special assistant to President William J. Clinton and, before that, director for Soviet affairs in the George H.W. Bush administation. He also served at the U.S. consulate in Jerusalem and the U.S. embassies in Egypt and Mauritania. He has received the Secretary of State's Distinguished Service Award, Johns Hopkins University's Woodrow Wilson Award for Public Service, and Boston College's Alumni Achievement Award. He has a BA from Boston College and an MA from the Johns Hopkins School of Advanced International Studies. Louis E. Caldera is the vice president of programs with the Jack Kent Cooke Foundation, where he leads the foundation's scholarship and grant programs and is responsible for the foundation's communications, information systems, program development, and evaluation functions. Caldera has a distinguished public service career that includes service as an officer in the U.S. Army, as a California legislator, as secretary of the army in the Clinton administration, and as president of the University of New Mexico. He also served in the Clinton administration as managing director and chief operating officer of the Corporation for National and Community Service. Prior to joining the Jack Kent Cooke Foundation, Caldera was a senior fellow at the Center for American Progress, a progressive think tank, where he focused on higher education, immigration, and other public policy matters affecting poor and ethnically and racially diverse communities in the United States. He served on President Barack Obama's Department of Defense transition team and was an assistant to the president and director of the White House Military Office in the early months of the Obama administration. Caldera is a graduate of the U.S. Military Academy at West Point and holds law and business degrees from Harvard University. Eileen B. Claussen is the president of the Pew Center on Global Climate Change and Strategies for the Global Environment. Claussen is the former assistant secretary of state for oceans and international environmental and scientific affairs. Prior to joining the Department of State, Claussen served for three years as a special assistant to the president and senior director for global environmental affairs on the National Security Council. She has also served as chairman of the United Nations Multilateral Montreal Protocol Fund. Claussen was director of atmospheric programs at the U.S. Environmental Protection Agency (EPA), where she was responsible for activities related to the depletion of the ozone layer, Title IV of the Clean Air Act, and the EPA's energy efficiency programs. Claussen is a member of the Council on Foreign Relations, the Ecomagination advisory board, the Harvard environmental economics program advisory panel, and the U.S. Commodity Future Trading Commission's advisory committee. She is the recipient of the Department of State's Career Achievement Award and the Distinguished Executive Award for Sustained Extraordinary Accomplishment. She also served as the Timothy Atkeson scholar in residence at Yale University. Nelson W. Cunningham is managing partner and a cofounder of McLarty Associates. Under his leadership, McLarty Associates has developed into a firm with global reach and over four dozen employees and advisers stationed in Washington and around the world. Cunningham served as special adviser to President Clinton on Western Hemisphere affairs and as general counsel at the White House Office of Administration. He previously served as general counsel to Chairman Joseph R. Biden of the Senate Judiciary Committee, focusing on constitutional, judicial, and criminal justice matters. He also served as an assistant U.S. attorney in the southern district of New York from 1988 to 1994. Cunningham was a campaign adviser and member of the Obama-Biden transition team and was a foreign policy and trade adviser to John Kerry's 2004 presidential campaign as well as to those of other Democratic candidates. He is an active member of the boards of the Institute of the Americas, the Business Council for International Understanding, the American Security Project, and the U.S.-India Business Council and is a member of the Yale president's council on international activities, the Department of State's advisory committee on international economic policy, the Export-Import Bank advisory committee, the Council of the Americas, and the Council on Foreign Relations. Cunningham is a graduate of Yale College and Stanford Law School. Eli Whitney Debevoise II is a senior partner in the law firm of Arnold & Porter LLP, with particular involvement in international financial transactions, public policy, international arbitration, multijurisdictional litigation, banking, and international trade. The firm acts as legal counsel to Brazil on certain transactional and litigation matters. He rejoined Arnold & Porter LLP in 2010 after serving as U.S. executive director of the World Bank beginning in 2007. During his tenure at the bank, he had a leading role in capital increase and share realignment negotiations and participated in preparations for G8 and G20 summits. Debevoise has lectured at Harvard Law School, Yale Law School, the Tuck School of Business at Dartmouth, and the Hungarian Institute for the Training of Bankers. In 2010, he gave the Lauder leadership lecture at the Lauder Institute at the University of Pennsylvania. He has written articles on sovereign finance, international banking, international arbitration, securities regulation, World Trade Organization dispute resolution, U.S. export controls, and sovereign immunity. Debevoise graduated from Yale University and Harvard Law School. He holds an honorary doctorate in law from the Vermont Law School and is a recipient of the Order of Rio Branco. Paula J. Dobriansky is the senior vice president and global head of government and regulatory affairs at Thomson Reuters. She is an adjunct senior fellow at Harvard University's John F. Kennedy Belfer Center for Science and International Affairs and holds the distinguished national security chair at the U.S. Naval Academy. From May 2001 to January 2009, Ambassador Dobriansky served as undersecretary of state for democracy and global affairs; in February 2007, she was appointed the president's special envoy on Northern Ireland. She served as senior vice president and director of the Washington office of the Council on Foreign Relations (CFR) and as CFR's first George F. Kennan senior fellow for Russian and Eurasian studies. Her other government appointments include associate director for policy and programs at the United States Information Agency, deputy assistant secretary of state for human rights and humanitarian affairs, and director of European and Soviet affairs on the National Security Council. From 1997 to 2001, she served on the U.S. Advisory Commission on Public Diplomacy. Ambassador Dobriansky received a BSFS from Georgetown University's School of Foreign Service and an MA and PhD from Harvard University. She is a recipient of various honors, including the secretary of state's highest honor, the Distinguished Service Medal. Shepard L. Forman is director emeritus and senior fellow of the Center on International Cooperation at New York University. Prior to founding the center, he directed the human rights and governance and international affairs programs at the Ford Foundation. He serves on the boards of the International Peace Institute, the Global Fairness Initiative, Peace Dividend Trust, and Scholars at Risk, among others. Forman received his PhD in anthropology from Columbia University and did postdoctoral studies in economic development at the Institute of Development Studies in Sussex, England. He served on the faculty at Indiana University, the University of Chicago, and the University of Michigan and conducted field research in Brazil and East Timor. He has authored two books on Brazil and numerous articles and policy papers on humanitarian assistance and postconflict reconstruction assistance and statebuilding. He is coeditor, with Stewart Patrick, of Good Intentions: Pledges of Aid to Countries Emerging from Conflict and Multilateralism and U.S. Foreign Policy: Ambivalent Engagement; with Romita Ghosh of Promoting Reproductive Health: Investing in Health for Development; and, with Bruce Jones and Richard Gowen, of Cooperating for Peace and Security. He also edited Diagnosing America: Anthropology and Public Policy, which examines the application of anthropological studies to social problems in the United States. José A. Fourquet serves as a managing director of the DBS Financial Group, one of the largest financial advisory firms in the state of Florida. Prior to that, Fourquet worked for four years as a managing director and head of the Miami private investment management branch of Lehman Brothers, Inc. Before joining Lehman, President George W. Bush nominated Fourquet and the U.S. Senate unanimously confirmed him to serve as U.S. executive director of the Inter-American Development Bank from 2001 to 2004. Prior, Fourquet worked for five years as a vice president in the fixed income, currency, and commodities division of Goldman, Sachs & Co., in New York. Fourquet began his career as an operations officer in the Central Intelligence Agency and spent over six years posted abroad in Latin America and the Caribbean, where he collected, evaluated, and reported high-priority intelligence of interest to U.S. policymakers. Fourquet graduated from Georgetown University with a BA in government and a School of Foreign Service special certificate in Latin American studies. He also obtained an MBA in finance from Columbia Business School, where he was inducted into the Beta Gamma Sigma honor society. Maria C. Freire is president of the Albert and Mary Lasker Foundation. Prior to this, she led the Global Alliance for TB Drug Development, transforming the organization into a world leader in tuberculosis drug development. An internationally recognized expert in technology commercialization, Freire directed the Office of Technology Transfer at the U.S. National Institutes of Health (NIH) and established the Office of Technology Development at the University of Maryland at Baltimore and in Baltimore County. Freire obtained her BS at Universidad Peruano Cayetano Heredia (Lima, Peru) and her PhD in biophysics from the University of Virginia. Active on the NIH advisory committee to the director, the international advisory steering committee of the Instituto Carlos Slim de la Salud (Mexico), the Association of American Medical Colleges advisory panel on research, and the international advisory panel to the Ministerial Working Group on Scaling up of Primary Health Systems, Freire was one of ten commissioners selected for the World Health Organization's Commission on Intellectual Property Rights, Innovation and Public Health (CIPIH). A member of the Institute of Medicine of the National Academies of Science, she has received the Department of Health and Human Services Secretary's Award for Distinguished Service, the Arthur S. Flemming Award, and the Bayh-Dole Award. Stanley A. Gacek* is a labor lawyer with both U.S. and international experience. He is a recognized expert on Brazilian labor and social issues and is the author of a thorough comparative analysis of the Brazilian and U.S. labor law systems, Sistemas de Relacoes do Trabalho: Exame dos Modelos Brasil-Estados Unidos. Gacek is currently serving as international relations officer in the U.S. Department of Labor's Bureau of International Affairs and is responsible for policy and comparative labor law analysis and for representing the U.S. government in its bilateral discussions with counterpart labor ministries throughout the world. Prior to his current job with the Labor Department, Gacek served as special counsel for international labor law at the Solidarity Center/AFL-CIO and associate director of the AFL-CIO's international department. He was the AFL-CIO's international affairs assistant director (Americas Region) from 1997 to 2005. He served as the assistant director for international affairs at the United Food and Commercial Workers International Union (UFCW) from 1984 to 1997 and was the UFCW's assistant general counsel from 1979 to 1984. Gacek received his BA in social studies from Harvard University and his JD from Harvard Law School. He was an adjunct professor at Harvard University in 2008 and has been an active member of the District of Columbia Bar Association. Sergio J. Galvis is a partner at Sullivan & Cromwell LLP and heads the firm's practice in Brazil and elsewhere in Latin America. For more than twenty-five years, Galvis has worked on hundreds of matters involving parties from more than twenty-five countries in Asia, Europe, and Latin America. His recent experience in Brazil includes the proposed combination of LAN Airlines and TAM S.A. In 2010, he received the Distinguished Global Citizen Award at the Global Kids annual benefit. He was named by the National Law Journal as one of the 50 Most Influential Minority Lawyers in America and by Hispanic Business magazine as one of the 100 Most Influential U.S. Hispanics in 2008. He is a three-time recipient of the Burton Award for Legal Achievement, most recently in 2011 for his article "Introducing Dodd-Frank," published in Latin Lawyer. In 2002, Galvis was part of a group of eminent practitioners convened by a G10 working group to help develop collective action clauses for sovereign debt financings. Kevin P. Green joined IBM in November 2004 and leads IBM's Department of Defense (DoD) and Intelligence Community business, which includes the U.S. Navy and Marine Corps, the U.S. Army, the U.S. Air Force, Joint Commands and DoD agencies, and National Security Intelligence agencies. Prior to joining IBM, Admiral Green spent thirty-three years as a naval officer, completing his navy career as deputy chief of naval operations (DCNO) for operations, plans, and policy. As DCNO, he coordinated global naval operations, strategic planning, information operations, and naval policy development and managed service relationships with the Office of the Secretary of Defense, the Joint Staff, the National Security Council staff, the U.S. military services, other federal agencies, and allied navies. As a flag officer, he commanded Naval Forces U.S. Southern Command, the Abraham Lincoln carrier battle group, and the Naval Training Center, Great Lakes, Illinois. He served in the Office of the Secretary of Defense, Atlantic Fleet headquarters, and the Bureau of Naval Personnel and commanded a destroyer squadron and a guided missile frigate. He graduated from the U.S. Naval Academy and the National War College and received an MS from the Naval Postgraduate School. Donna J. Hrinak is vice president for global public policy at PepsiCo, Inc. She has served as U.S. ambassador to four countries—Brazil, Venezuela, Bolivia, and the Dominican Republic—and as deputy assistant secretary of state for Mexico and the Caribbean. She also had assignments in Colombia, Honduras, Mexico, and Poland. Ambassador Hrinak's honors include the U.S. government's Distinguished Public Service Award and the State Department's Career Achievement Award. In 2005, she was named international businesswoman of the year by the Miami chapter of the Organization of Women in International Trade. She serves on the board of directors of the Inter-American Dialogue and on the board of counselors of McLarty Associates. She is based in Purchase, NY. Robert L. Hutchings is dean of the Lyndon B. Johnson School of Public Affairs at the University of Texas at Austin. Prior to this, Hutchings was diplomat in residence at the Woodrow Wilson School of Public and International Affairs at Princeton University. He was also faculty chair of the master in public policy program and served for five years as assistant dean. From 2003 to 2005, on public service leave from Princeton, he was chairman of the U.S. National Intelligence Council. He has also served as a fellow and director of international studies at the Woodrow Wilson International Center for Scholars, as the National Security Council's director for European affairs, and as special adviser to the secretary of state, with the rank of ambassador. Ambassador Hutchings was deputy director of Radio Free Europe and on the faculty of the University of Virginia, and he has held adjunct appointments at the Johns Hopkins University School of Advanced International Studies and Georgetown University's School of Foreign Service. He is a director of the Atlantic Council of the United States and the Foundation for a Civil Society and is a member of the Council on Foreign Relations, the British-North American Committee, and the executive committee of the Association of Professional Schools of International Affairs. G. John Ikenberry is the Albert G. Milbank professor of politics and international affairs at Princeton University in the Woodrow Wilson School. He has also taught previously at Georgetown University and the University of Pennsylvania. He has held posts at the State Department, on the policy planning staff, and at the Carnegie Endowment for International Peace, as a senior associate. Ikenberry has also been a nonresident senior fellow at the Brookings Institution. During 2002–2004, he was a transatlantic fellow at the German Marshall Fund. In 1998–99, Ikenberry was a fellow at the Woodrow Wilson International Center for Scholars. In 1997–98, he was a CFR international affairs fellow in Japan, sponsored by Hitachi Ltd., and spent a year affiliated with the Institute for International Policy Studies in Tokyo. He has published in all the major academic journals of international relations and written widely in policy journals in addition to authoring several books. He is also the reviewer of books on political and legal affairs for Foreign Affairs. Ikenberry has just published a new book, Liberal Leviathan: The Origins, Crisis, and Transformation of the American World Order. He received his PhD from the University of Chicago. Timothy M. Kingston is a partner and managing director at Goldman, Sachs & Co., and coheads the global power effort within the investment banking division. He joined Goldman Sachs in May 1988, and his career has spanned various geographies and functional areas, including ten years in the Latin American group, where he served ultimately as chief operating officer and concentrated on Brazil. Kingston serves on the advisory boards of the Latin American studies program at Princeton University and the North American board of INSEAD and is a director of the North American Chilean Chamber of Commerce. He was previously a director of Mercado Libre. Kingston is a graduate of Princeton University and holds an MBA from INSEAD. Thomas E. Lovejoy was elected university professor at George Mason University in March 2010. He also holds the biodiversity chair at the Heinz Center for Science, Economics, and the Environment and was president from 2002 to 2008. Starting in the 1970s, he helped bring attention to the issue of tropical deforestation, and in 1980, he published the first estimate of global extinction rates. Lovejoy has worked on the interaction between climate change and biodiversity for more than twenty years, coining the term biological diversity and originating the concept of debt-for-nature swaps. He is the founder of the public television series Nature and has served as the senior adviser to the president of the United Nations Foundation, the World Bank's chief biodiversity adviser and lead specialist for the environment for the Latin American region, the Smithsonian Institution's assistant secretary for environmental and external affairs, and executive vice president of World Wildlife Fund-U.S. He has served on advisory councils in the Reagan, George H.W. Bush, and Clinton administrations. In 2009 he was appointed conservation fellow by the National Geographic Society. He chairs the scientific and technical panel for the Global Environment Facility. He received his BS and PhD from Yale University. Jennifer L. McCoy is director of the Carter Center's Americas program and has been professor of political science at Georgia State University since 1984. As part of her responsibilities overseeing the Americas program, she directs the Carter Center's Friends of the Inter-American Democratic Charter group, and she previously managed the Carter Center's project on mediation and monitoring in Venezuela from 2002 to 2004. She has directed election-monitoring missions for the Carter Center in Bolivia, Nicaragua, Panama, Mexico, Venezuela, Jamaica, and Peru and has participated in election delegations to Indonesia, Haiti, Suriname, and Guyana. McCoy's academic career has included extensive fieldwork in Venezuela, Nicaragua, and Uruguay, where she conducted research as a Fulbright fellow in 1991 and 1992. A specialist on democratization, international collective protection and promotion of democracy, and Latin American politics, McCoy's most recent book is International Mediation in Venezuela (with Francisco Diez). She is also editor and contributor to The Unraveling of Representative Democracy in Venezuela (with David Myers), Do Politicians Learn from Political Crises? and Venezuelan Democracy Under Stress. Joy Olson is executive director of the Washington Office on Latin America (WOLA) and is a leading expert on human rights and U.S. policy toward Latin America. Under Olson's direction, WOLA is pioneering new approaches to human rights advocacy, focusing on the underlying causes of injustice, inequality, and violence. The Washington Post has recognized WOLA as one of the best-managed nonprofits in the Washington area. Olson specializes in military and security policy, and she has been a longtime advocate for greater transparency of military programs in Latin America. She cofounded the Just the Facts project, which makes information about U.S. military policy in Latin America publicly accessible. For more than a decade, she has coauthored an annual study on trends in U.S. security assistance, including the recent report Waiting for Change. Prior to joining WOLA, Olson directed the Latin America Working Group, a coalition of sixty nongovernmental organizations working to promote peaceful and just U.S. foreign policy toward Latin America. Olson has testified before Congress on Latin America policy issues ranging from human rights in Mexico to drug policy to the problems of poverty and inequality in the region. She is a frequent commentator in the media, including on CNN, CNN Español, the BBC, PBS NewsHour, National Public Radio, and an array of national and international news outlets. Olson earned an MA from the National Autonomous University of Mexico, following two years' work in community development in Honduras. Brian D. O'Neill is vice chairman of Lazard International. His responsibilities include Latin America and Canada. O'Neill has extensive experience working with governments, local and multinational corporations, and financial institutions. He is a director of Signatura Lazard in Brazil and MBA Lazard in Central and South America and partner assigned to the firm's strategic alliance Alfaro, Davila y Rios S.C. in Mexico. O'Neill served as deputy assistant secretary in the U.S. Treasury from 2007 to 2009. For a five-month period in 2008, he was acting U.S. director of the Inter-American Development Bank. Prior to that, he worked for JPMorgan Chase for over thirty years, where he held multiple leadership roles, including chairmcan of investment banking for Latin America and Canada from 2001 to 2006. He lived and worked in South America for twelve years in Santiago, Chile; Buenos Aires, Argentina; and São Paulo, Brazil. O'Neill is a director of the Council of the Americas, the Americas Society, and the Inter-American Dialogue. He is a member of the Council on Foreign Relations and a member of the advisory committee for the David Rockefeller Center for Latin America Studies at Harvard University. Michelle Billig Patron is senior director of PIRA Energy Group. Prior to joining PIRA, Patron was an international affairs fellow at the Council on Foreign Relations and conducted energy research at Deutsche Bank. Earlier in her career, she served as an international policy adviser at the U.S. Department of Energy (DOE) under the Clinton and George W. Bush administrations. During that time, she advised the U.S. energy secretary and other senior U.S. officials on relations with major energy-producing and -consuming countries, including Venezuela, Mexico, Brazil, China, Nigeria, and the European Union. In 2001, Patron served as energy attaché at the U.S. Embassy in Beijing. Prior to the DOE, she worked at the International Energy Agency, the White House, UNICEF, and the Center for International Environmental Law. Patron holds a BA from Columbia University and an MA from the Johns Hopkins School of Advanced International Studies. She has served as a commentator to CNBC, BBC, NPR, the New York Times, and the Economist and has written for Foreign Affairs, the Financial Times, and the Los Angeles Times. David Perez has served as a managing director with Palladium Equity Partners since 2003. Previously, he held senior private equity positions at General Atlantic Partners and Atlas Venture and also held positions at Chase Capital Partners and James D. Wolfensohn, Inc. Perez serves on the board of directors of Palladium's privately held portfolio companies Aconcagua Holdings, Inc.; American Gilsonite Company; Capital Contractors, Inc.; DolEx Dollar Express, Inc.; Jordan Healthcare Holdings, Inc.; and Prince Minerals, Inc. Perez serves as the chair of the board of directors of the National Association of Investment Companies, is a member of the Council on Foreign Relations, and is the president of the board of directors of Ballet Hispánico. Perez earned a BS/MS degree from the Dresden University of Technology, an MEng degree in engineering management from Cornell University, and an MBA from Harvard Business School. Riordan Roett is the Sarita and Don Johnston professor of political science and director of Western Hemisphere studies at the Johns Hopkins Paul H. Nitze School of Advanced International Studies (SAIS). In 2004, SAIS announced the establishment of the Riordan Roett chair in Latin American studies. From 1983 to 1995, Roett served as a consultant to the Chase Manhattan Bank in various capacities; in 1994–95 he was the senior political analyst in the emerging markets division of the bank's international capital markets group. Roett is a member of the board of directors of several mutual funds at Legg Mason, Inc. He is a member of the Council on Foreign Relations and the Bretton Woods Committee and is a former national president of the Latin American Studies Association. He is author and editor of several books, including, most recently, The New Brazil. Roett received his BA, MA, and PhD from Columbia University. David J. Rothkopf serves as president and chief executive of Garten Rothkopf. He is also a visiting scholar at the Carnegie Endowment for International Peace and chairs the Carnegie Economic Strategy Roundtable and the National Strategic Investment Dialogue. He is also the author of Running the World: The Inside Story of the National Security Council and Superclass: The Global Power Elite and the World They Are Making. His next book, Power, Inc.: The Epic Rivalry Between Big Business and Government—and the Reckoning that Lies Ahead will be published in 2012. He also writes a daily blog for ForeignPolicy.com. Prior to the establishment of Garten Rothkopf, he was chairman, CEO, and cofounder of Intellibridge Corporation, a leading provider of international analysis and open-source intelligence. Prior to that, he was managing director of Kissinger Associates, the international advisory firm founded and chaired by former U.S. secretary of state Henry A. Kissinger. Rothkopf served as acting U.S. undersecretary of commerce for international trade, directing the 2,400 employees of the International Trade Administration. He joined the Clinton administration in 1993 as deputy undersecretary of commerce for international trade policy development. Rothkopf was cofounder, chairman, and CEO of International Media Partners, Inc., publisher of CEO magazine and Emerging Markets and organizer of the CEO Institutes. Andrew Small currently serves as the director of the committee that oversees relations between U.S. bishops and the Catholic Church in Latin America and the Caribbean. Father Small was the foreign policy adviser for the United States Conference of Catholic Bishops from 2004 to 2009. He has written extensively on the church's role in the public square and has delivered testimony before the U.S. Congress on the impact of U.S. trade policy on developing countries. Julia E. Sweig is the Nelson and David Rockefeller senior fellow for Latin America studies, director for Latin America studies, and director of the Global Brazil initiative at the Council on Foreign Relations (CFR). She is the author of Cuba: What Everyone Needs to Know and Friendly Fire: Losing Friends and Making Enemies in the Anti-American Century, as well as of numerous publications on Latin America and American foreign policy. She has directed several CFR reports on Latin America. Sweig's Inside the Cuban Revolution: Fidel Castro and the Urban Underground received the American Historical Association's Herbert Feis Award for best book of the year by an independent scholar. Tanisha N. Tingle-Smith is the principal and founder of Verdade Consulting, a boutique Brazil-focused risk advisory and research consultancy. Her research specializes in Brazilian international relations, with particular focus on the geoeconomics of Brazil's relations with the Global South. She has presented at and contributed to articles and book chapters for U.S. and international universities. In 2008–2009, she was a consultant at the United Nations Development Program on Brazil-Africa South-South development exchange. Earlier, she served as foreign policy analyst and adviser with the U.S. Central Intelligence Agency and the departments of State and Treasury. She received department recognition and awards for her analytic work. From 1995 to 2001, she was an analyst and assistant vice president for Latin America economic research with Salomon Smith Barney and Merrill Lynch. She is a term member of the Council on Foreign Relations. She holds an MIA from the School of International and Public Affairs at Columbia University. James D. Wolfensohn is chairman of Wolfensohn & Company, LLC, chairman of Citigroup's international advisory board, and adviser to Citigroup's senior management on global strategy and on international matters. In 2006, he established the Wolfensohn Center for Development at the Brookings Institution. Wolfensohn was president of the World Bank Group from 1995 to 2005. He was special envoy for Gaza disengagement for the quartet of the Middle East; president and CEO of James D. Wolfensohn, Inc.; executive partner of Salomon Brothers, New York; executive deputy chairman and managing director of Schroders, London; president of J. Henry Schroders Banking Corporation, New York; and managing director of Darling & Co., Australia. He is chairman emeritus of the board of trustees of the John F. Kennedy Center for Performing Arts and of Carnegie Hall. In addition, he has been president of the International Federation of Multiple Sclerosis Societies, chairman of the board of the Institute for Advanced Study at Princeton University, director of the Business Council for Sustainable Development, chairman of the finance committee and a director of the Rockefeller Foundation and the Population Council, and a member of the board of Rockefeller University. He is an honorary trustee of the Brookings Institution, a member of the Council on Foreign Relations, and a member of the Century Association. *Gacek participated in the Task Force under his previous affiliation with the American Federation of Labor and Congress of Industrial Organizations. As a current administration official, he has not been asked to join the Task Force consensus.